I, who have sent armies into fire and soldiers to their death, say today: We sail onto a war which has no casualties, no wounded, no blood nor suffering. It is the only war which is a pleasure to participate in – the war for peace. We, like you, are people who want to build a home, to plant a tree, to love, live side by side with you in dignity, in empathy, as human beings, as free men. We are today giving peace a chance and again saying to you in a clear voice: Enough. 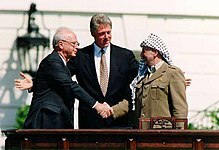 Yitzhak Rabin (1 March 1922 – 4 November 1995) was an Israeli general, statesman and prime minister, who won the 1994 Nobel Peace Prize (together with Shimon Peres and Yasser Arafat). He was the fifth Prime Minister of Israel, serving two terms in office, 1974–77 and 1992 until his assassination in 1995, by a right-wing Israeli radical opposed to Rabin's signing of the Oslo Accords. This page was last edited on 20 February 2019, at 16:49.